Because of this continuing belief, the Gospel Advocate is the oldest journal among churches of Christ and is now the fifth oldest U.S. magazine still in publication (www.sporcle.com). During my lifetime I have had the privilege of knowing some of the editors. I didn’t know Foy E. Wallace when he was the editor of the GA, but I knew him personally when I was a teenager as he spoke often at the congregation where I grew up. I knew of the writings of B.C. Goodpasture, but not until I was in college did a family friend take me to his house to meet him. I admired how, as editor, he dealt with “legalism” as seen in the “non-institutional” movement and also those who promoted modern movements. Guy N. Woods worked to maintain faithfulness to Scripture. He held more than 40 gospel meetings a year and wrote many books and our adult curriculum. Whenever he was in his office, he and I would spend 15-20 minutes visiting. Furman Kearley and I attended graduate school together. He was an excellent student and dealt with a rise in the belief of “premillennialism” during his tenure as editor. He also tried to stop the rise of “liberalism,” especially in his work in academia and the battles he fought there. Greg Tidwell and I met when he came to St. Louis for a youth meeting. While he was there, he was baptized. I renewed our acquaintance when we moved to Nashville and he was in school with my children, Neila and Kerry. As editor, Greg, with his biblical scholarship, addresses problems in the church that have continued to resurface with most every generation. I commend him for promoting biblical restoration bridging the gaps between young and old. Looking back on the years I served as editor, I tried to be “steadfast, immovable, always abounding in the work of the Lord” (1 Corinthians 15:58). My goal was to keep a steady course during the uncertainty of changing times within the church and society. My parents became first-generation Christians in 1935. We always had the Gospel Advocate and the GA curriculum in our house. As a college student in the 1950s, I thought all, if not most, of the problems I heard older Christians speak of within the church had surely been resolved. But the older I became I realized, “the more things change, the more things stay the same.” The articles in the July anniversary issue illustrate that expression. Each article begins with an excerpt from one of the many outstanding Bible students, writers and staff members who have contributed to the “Old Reliable” during the past 160 years. The excerpts are followed by new articles on the same topic by some of today’s outstanding Bible students, writers and staff members. The Gospel Advocate has faithfully served generations of Christians for 160 years. Its leaders were always at the forefront of encouraging missions, benevolence and Christian education. But when troubles arose in the church, they used the pages of the GA to take a stand. It neither served the right nor catered to the left but endeavored to maintain the purity of the gospel. Perhaps those are just some of the reasons we have been blessed by God for 160 years. 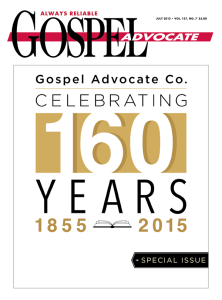 If you would like a copy of the July 2015 issue of Gospel Advocate, or to subscribe, call 1-800-251-8446.